The Docklands Light Railway (DLR) required a PAVA system for their network which serves central and east London including Lewisham, Tower Gateway, Bank, London City Airport, and the financial district of Canary Wharf. 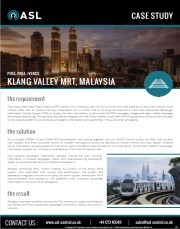 The Public Address and Voice Alarm (PAVA) system was required to integrate with an existing signalling system and the operational control centres to provide automated train service announcements in additional to travel messages or emergency information. With 45 stations to manage, many unmanned, it was essential that DLR were provided with a solution that could be fully relied upon. 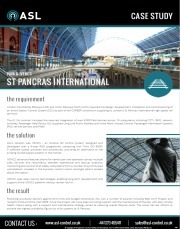 ASL provided a fully integrated IP solution to create a Long Line Public Address (LLPA) system incorporating Voice Alarm functionality. Thesystem amplifiers and mainframe provide highly efficient amplification combined with low whole life costs and exceptional reliability. ASL’s adaptive Class-D technology, coupled with the iVENCS based control system at the Operational Control Centres, is ideally suited to meeting the requirements of the large, modern, rail network. The features of the DLR solution, including loudspeaker line monitoring, audio routing, Voice Over IP (VOIP), Text-to-Speech, and Digital Voice Announcements (DVA), are fully controllable via the iVENCS PA Control System. 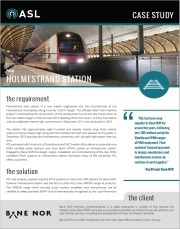 This system facilitated multiple operators to manage the network simultaneously and provided instant fault-reporting, easy management of automated train announcements, and the ability to select individual or multiple stations or PA zones for tailored live announcements. Two iVENCS workstations and associated servers were supplied to the Operational Control Centres with an additional remote backup suite to provide full dual redundancy. 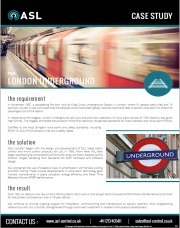 ASL’s solution was a success, where the system continues to operate across the DLR network. Clear announcements at optimum broadcast levels have improved the experience of both passengers and local residents. ASL continue to provide DLR with public address and voice alarm solutions, where ASL equipment has been used for more recent upgrades to the system.